"Britain's most watched news channel"
"Whenever you need to know"
On 22 February 2006, the channel was named News Channel of the Year at the Royal Television Society Television Journalism Awards for the first time in its history. The judges remarked that this was the year that the channel had "really come into its own." From May 2007, UK viewers could watch the channel via the BBC News website. In April 2008, the channel was renamed "BBC News" as part of a £550,000 rebranding of the BBC's news output, complete with a new studio and presentation. Its sister service, BBC World was also renamed as "BBC World News" while the national news bulletins became BBC News at One, BBC News at Six and BBC News at Ten. Across the day the channel averages about twice the audience of Sky News. As a major part of the BBC News department, the channel is based at and broadcast from Broadcasting House in Central London. It was named RTS News Channel of the Year in 2006 and again in 2009. BBC News 24 was originally available only to analogue cable television subscribers. To this day, it and BBC Parliament remain the only BBC "digital" channels which are made available to analogue cable subscribers. This coverage was improved in 1998 with the advent of digital television in the United Kingdom allowing satellite and digital terrestrial television viewers to also view the service. Initially it was difficult to obtain a digital satellite or terrestrial receiver without a subscription to Sky or ONdigital respectively, but now the channel forms an important part of the Freeview and Freesat channel packages. The BBC had run the international news channel BBC World for two and a half years prior to the launch of BBC News 24 on 9 November 1997. Sky News had had a free hand with domestic news for over eight years (since 5 February 1989) and being owned by News Corporation their papers were used to criticise the BBC for extending its news output. Sky News objected to the breaking of its monopoly, complaining about the costs associated with running a channel that only a minority could view from the licence fee. Sky News claimed that a number of British cable operators had been incentivised to carry News 24 (which, as a licence-fee funded channel was made available to such operators for free) in preference to the commercial Sky News. However, in September 1999 the European Commission ruled against a complaint made by Sky News that the publicly funded channel was unfair and illegal under EU law. The Commission ruled that the licence fee should be considered state aid but that such aid was justified due to the public service remit of the BBC and that it did not exceed actual costs. The channel's journalistic output has been overseen by Controller of the channel, Kevin Bakhurst, since 16 December 2005. This was a return to having a dedicated Controller for the channel in the same way as the rest of the BBC's domestic television channels. At launch, Tim Orchard was Controller of News 24 from 1997 until 2000. Editorial decisions were then overseen by Rachel Atwell in her capacity as Deputy Head of television news. Her deputy Mark Popescu became responsible for editorial content in 2004, a role he continued in until the appointment of Bakhurst as Controller in 2005. A further announcement by Head of television news Peter Horrocks came at the same time as Bakhurst's appointment in which he outlined his plan to provide more funding and resources for the channel and shift the corporation's emphasis regarding news away from the traditional BBC One bulletins and across to the rolling news channel. The introduction of simulcasts of the main bulletins on the channel was to allow the news bulletins to pool resources rather than work against each other at key times in the face of competition particularly from Sky News. The BBC Governors' annual report for 2005/2006 reported that average audience figures for fifteen-minute periods had reached 8.6% in multichannel homes, up from 7.8% in 2004/2005. The 2004 report claimed that the channel outperformed Sky News in both weekly and monthly reach in multichannel homes for the January 2004 period, and for the first time in two years moved ahead of Sky News in being perceived as the channel best for news. On 21 April 2008, BBC News 24 was renamed BBC News on the channel itself – but is referred to as the BBC News Channel on other BBC services. This is part of the creative futures plan, launched in 2006, to bring all BBC News output under the single brand name. The BBC News Channel moved from the Studio N8 set, which became home to BBC World News, to what was the home of the national news in Studio N6, allowing the Channel to share its set with the BBC News at One and the BBC News at Ten – with other bulletins moving to Studio TC7. The channel relocated, along with the remaining BBC News services at Television Centre, to the newly refurbished Broadcasting House on 18 March 2013 at 13:00 GMT. Presentation and on-screen graphics were refreshed, with new full HD studios and a live newsroom backdrop. Moving cameras in the newsroom form part of the top of the hour title sequence and are used at the start of weather bulletins. 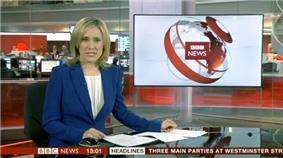 On 16 July 2013, the BBC announced that a high-definition (HD) simulcast of BBC News would be launched by early 2014. The channel broadcasts on the BBC's new HD multiplex on Freeview. HD output from BBC News has been simulcast on BBC One HD and BBC Two HD since the move to Broadcasting House in March 2013. The channel launched on 10 December 2013 (at an early date), though will roll-out nationwide up to June 2014 (as will BBC Four HD and CBeebies HD). 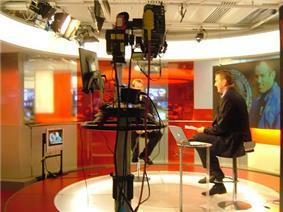 BBC News at Broadcasting House in March 2013. Each hour consists of headlines on each quarter-hour, extended at the top of the hour to form the main part of the daily schedule though these are interspaced with other programmes, generally at weekends. This will be often be displaced by rolling news coverage including reports and live interviews. Weather summaries are provided every half-hour by forecasters from the BBC Weather centre and the sports news from the BBC Sport centre at MediaCityUK. The BBC maintains guidelines for procedures to be taken for breaking news. With domestic news, the correspondent first recorded a "generic minute" summary (for use by all stations and channels) and then priority was to report on BBC Radio 5 Live, then on the BBC News channel and any other programmes that are on air. Since 5 Live's move to Manchester, this has been reversed. For foreign news, first a "generic minute" is recorded, then reports are to World Service radio, then the reporter talks to any other programmes that are on air. A key claim made by Lord Lambert in his report had been that the channel was slower to react to breaking news compared with its main rival Sky News. To counteract this, a new feature introduced with the 2003 relaunch was a 'breaking news sting': a globe shown briefly onscreen to direct a viewer's attention to the breaking news. The graphics relaunch in January 2007 has since seen the globe sting replaced by a red strapline to highlight the breaking story immediately. To complement this, a permanent live news ticker had earlier been introduced in 2006: this had previously been in use only sporadically. News statements are shown as continuously scrolling upper-case text located at the bottom of the screen; some past ambiguities noted have included spelling the plural of MPs as "MPS", together with other occasional spelling and grammatical errors. The design of this ticker was slightly altered with the 2007 graphics redesign and from June turned red to indicate breaking news, as Newswatch reported viewers' confusion. The ticker is removed during trails and weather forecasts. The BBC began simulcasting the channel overnight on terrestrial channel BBC One with the launch of the channel, ending the tradition of a closedown but at the same time effectively making the service available to many more viewers. In the early 2000s, BBC Two also started simulcasting the channel, although the weekend morning show Weekend 24 had been simulcast on the channel in the early days. During major breaking news events, the BBC News Channel has been broadcast on BBC One; examples of special broadcasts include the 11 September 2001 attacks, 7 July 2005 London bombings, the capture of Saddam Hussein, and the death of Osama bin Laden. Coverage of major events has also been simulcast on BBC World News. Currently, overnight viewers receive 25-minute editions of BBC News every hour, and on weekdays 00:00–01:30 receive Newsday, live from Singapore and from London 01:30–02:00 ABC World News Tonight 02:00–05:30 (00:00–06:00 on weekends) receive BBC World News. BBC Breakfast has been simulcast since launch (in 2000) on BBC One and BBC News, replacing the individual breakfast shows that had run on both channels. Since May 2006, the simulcast runs from 06:00 until 08:30. Breakfast on BBC One then continues from MediaCityUK until 09:15 with entertainment and features, whilst BBC News reverts to its traditional format. The BBC News at Ten began simulcasting on the channel on 30 January 2006 as part of the Ten O'Clock Newshour, followed by extended sport and business news updates. 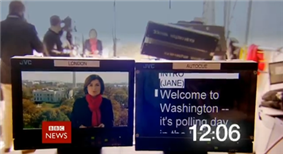 The bulletin was joined in being simulcast on 10 April 2006 when the BBC News at One (with British Sign Language in-vision signing) and BBC News at Six bulletins were added to the schedule following a similar format to the News at Ten in terms of content on the channel once each simulcast ends. During the summer, the hour-long programme News 24 Sunday was broadcast both on BBC One and the BBC News Channel at 09:00, to replace The Andrew Marr Show, which is off air. It was presented by a news presenter, and came from the main News channel studio. The programme was made up mostly of interviews focusing on current affairs, and included a full paper review, a weather summary, and a news update at 09:00, 09:30 and 10:00. Sunday Morning Live and alternate programming now fill this slot. From 2013, a new programme was created for BBC Two for 11am-12pm weekdays, consisting of 30 minutes domestic and 30 minutes of BBC World News. On Wednesdays, when parliament is sitting the latter is replaced by the Daily Politics for coverage of Prime Ministers Questions. BBC World News – The latest international news as they break from the BBC. BBC News - The latest national and international news as they break from the BBC. Newsday – Live international news from London and Singapore every weekday. With Babita Sharma, Kasia Madera (London) and Rico Hizon, Sharanjit Leyl (Singapore). Asia Business Report – Live from Singapore the essential business news as it breaks and a look ahead to the news that will shape the business day. Sportsday/Sport Today – All the latest sports news and results from around the globe. World Business Report – The latest business news with informed analysis from the world's financial centres. Business Live- Sally Bundock and Ben Thompson with the latest business news as it breaks and a look ahead to the news that will shape the business day. With the latest news from end of trading in Asia, latest from Europe, Middle East and Americas. Victoria Derbyshire - original stories, exclusive interviews, audience debate and breaking news, Victoria Derbyshire or Naga Munchetty presents the BBC's new daily news and current affairs programme. Click – A guide to gadgets, websites, games and computer industry news. Dateline London – Foreign correspondents based in London give their views on the week's international news. HARDtalk – Stephen Sackur talks to newsmakers and personalities from across the globe. Our World – Features the BBC's news programmes on current issues around the world. The documentaries are intended to showcase BBC journalism at its best. Reporters – A weekly showcase of reports from the BBC's global network of correspondents. Politics Europe – An in-depth look at the politics of Europe presented by Andrew Neil and Jo Coburn (only shown in Europe; also shown on BBC Parliament in the UK). The World Debate – The panels and contributing audiences discuss topical themes put to representatives from global politics, finance, business, the arts, media and other areas. Health Check - presented by Dr Ayan Panja and Claudia Hammond is transmitted four times each month at weekends and covers developments in global health, including interviews with health experts. Panorama – Current affairs programme, featuring interviews and investigative reports on a wide variety of subjects. The Editors - a monthly programme looking at what's happening in each editor's area. Inside F1 - The latest news from the paddock and a round up of the days action. Previous BBC News programming includes Head 2 Head, Your News, E24, The Record Europe, STORYFix and News 24 Tonight, a weekday evening programme which ran from 2005 to 2008, providing a round up of the day's news. As part of budget cuts, major changes to the channel were announced in late 2014/early 2015. This included axing some bulletins and replacing them with Victoria Derbyshire and BBC Business Live with Bundock and Thompson in the morning. Outside Source with Ros Atkins – an "interactive" show already broadcast on BBC World – aired Mondays-Thursday at (During major stories 18:00) and 21:00 and a new edition of World News Today Friday-Sunday at 21:00 (During major stories 19:00/20:00 Monday-Friday) adding to the 19:00 edition on BBC Four. HARDtalk was moved to the 20:30 in May. 00:00 edition was replaced on Sundays-Thursday with Newsday and on Friday-Saturday a standard edition of BBC World News. Between 00:00 and 06:00 UK time, the channel simulcasts with its sister channel, BBC World News, for the first 25 minutes of each hour with world news shown all through the simulcasts. Previously UK output continued until 01:00. Simulcasts may also happen during major or set-piece events; the News Channel presenter will join the BBC World News presenter in Studio C as it used by both channels, or a journalist will present on location. Examples include Glasgow Helicopter Crash, the election of Pope Francis and the Boston Marathon bombing and certain European elections. On 1 October 2007, BBC World News started broadcasting BBC World News America and World News Today at 00:00 and 03:00 GMT respectively. World News Today was simulcast on the BBC News channel at 03:00 GMT. BBC World News America used to be aired as a reduced length, tape-delayed version at 00:30 GMT. ABC World News Tonight with David Muir also shown at 01:30 every Tuesday-Friday. From 13 June 2011, the weekday editions of BBC News at 01:00, 02:00, 03:00 and 04:00 were replaced with Newsday. The programme acts as a morning news bulletin for the Asia-Pacific region and is broadcast as a double-headed news bulletin with Rico Hizon in Singapore and Babita Sharma in London. Asia Business Report and Sport Today are aired at the back of the first three hours of Newsday. But Newsday changed to 23:00–02:00 On BBC News a year later meaning. Mike Embley presents Tuesday-Friday BBC World News 23:00–02:00 with Kasia Madera on Saturdays and Daniela Ritorto 00:00–06:00 Sunday, 02:00–05:00 Friday/Monday. the slot's focus is placed on audiences watching on PBS in the U.S. In June 2015 this was change to Newsday at 00:00-02:00. BBC World News and World Business Report air at 05:00 on both channels and in lieu of commercials seen on the international broadcasts, the presenters give a brief update on UK news for domestic audiences. In June 2015, they will simulcast Outside Source with Ros Atkins on Mondays-Thursday at (During major stories 18:00) / at 21:00 and a new edition of World News Today Friday-Sunday at (during major stories Monday-Friday 19:00) 21:00. Traditionally, during simulcasts in December, care has been taken to conceal the newsroom Christmas tree for international audiences. Since 5 March 2012, sports bulletins come from the BBC Sport Centre in MediaCityUK in Salford Quays, where the sports network BBC Radio 5 Live is also based. Headlines are usually provided at 15 minutes past the hour with a full bulletin after the bottom-of-the-hour headlines. There are also extended sports bulletins per day, entitled Sportsday or Sport Today (when simulcasting with BBC World News) broadcast at 00:45, 01:45, 02:45, 03:45, 13:30, 18:30, (19:30 Weekends only), 22:45 and 23:45 (weekdays only). Each bulletin is read by a single sports presenter, with the exception of Saturday Sportsday, which is double headed. The channel's sports bulletins (internally known as Sport 24) have always had a separate, dedicated production gallery, which is also responsible for the graphics. Bulletins during BBC Breakfast are presented by Sally Nugent or Mike Bushell, with the latter also appearing on other sports bulletins on the channel. As of March 2012 the main sports presenters on the channel are Olly Foster, Katie Gornall, Katherine Downes, Damian Johnson, Andrew Lindsay and Jenny Culshaw. Until March 2012 bulletins came from the News Channel studio at 45 minutes past the hour. Presenters for bulletins on the channel have included: Reshmin Choudhury, Matthew Pinsent. Before BBC News moved to Broadcasting House, an hourly business update was included during the weekday schedule from the BBC Business Unit. There were two shifts, from 08:30–14:00 and 14:00–23:00, presented by Penny Haslam, Maryam Moshiri, Ben Thompson, Adam Parsons, Susannah Streeter, Joe Lynam, Sara Coburn or Sally Eden. News Channel updates were usually broadcast at 40 minutes past the hour from 08:40 until 22:40. The 21:40 round-up was often earlier and the final bulletin is an extended round-up of the day's business news. Until May 2009, the business updates on the BBC News Channel were broadcast from one of the London Stock Exchange's studios in central London. From then until March 2013 the bulletins were provided from the channel's studio at BBC Television Centre. The business updates were axed in March 2013 as part of the BBC's Delivering Quality First plan. But after complaints returned in November 2013. Stock market updates now only appear during the headlines at 45 minutes past the hour. But it was changed after complaints in November with Ben Thompson and Victoria Friz are the main presenters sharing 08:00–14:00 or 14:00–18:00 between them. with Juliette Foster, Adam Parsons, Alice Baxter, Jamie Robertson, Aaron Heslehurst and Sally Bundock offer relief. Bundock and Thompson present Business Live on weekdays at 08:30. Declan Curry presents Your Money a weekly round-up on a Saturday morning. Rico Hizon or Sharanjit Leyl regularly present the main business stories during the early hours of the morning from Singapore during the BBC's Asia Business Report, which is simulcast from BBC World News. Alice Baxter and Sally Bundock present World Business Report. The simulcasting of the main national news bulletins has led to the presenters of those bulletins appearing on the channel and offer relief on the news channel including Huw Edwards, Sophie Raworth, Kate Silverton and Mishal Husain. The main Breakfast presenters have also appeared on the channel since it was first launched as a simulcast programme in 2000, with the current presenters being Bill Turnbull, Louise Minchin and Charlie Stayt and Naga Munchetty. During a major news event one or more of the main news presenters may be sent to present live for the channel from the scene of the story, where they will conduct interviews with the people involved, question correspondents, introduce related reports and also give general information on the story, much as a reporter sent to cover a story would. The presenters often have expertise in the story they are sent to cover, for example channel presenters and former reporters Ben Brown and Clive Myrie were dispatched to Cairo and Tripoli during the Middle East uprisings. The channel was criticised at launch for its style of presentation, with accusations of it being less authoritative than the BBC One news bulletins, with presenters appearing on-screen without jackets. Jenny Abramsky had originally planned to have a television version of the informal news radio channel BBC Radio 5 Live, or a TV version of Radio 4 News FM both of which she had run. The bright design of the set was also blamed for this – one insider reportedly described it as a "car crash in a shower" – and was subject to the network relaunch on 25 October 1999. The channel swapped studios with sister channel BBC World, moving to studio N8 within the newsroom, where it remained until 2008. 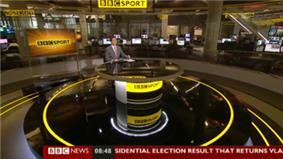 New music and title sequences accompanied this set change, following the look of newly relaunched BBC One bulletins. Graphics and titles were developed by the Lambie-Nairn design agency and were gradually rolled out across the whole of BBC News, including a similar design for regional news starting with Newsroom South East and the three 'BBC Nations' – Scotland, Wales and Northern Ireland. The similarity of main BBC News output was intended to increase the credibility of the channel as well as aiding cross-channel promotion. A graphics relaunch in January 2007 saw the channel updated, with redesigned headline straplines, a redesigned 'digital on-screen graphic' and repositioned clock. The clock was originally placed to the left hand side of the channel name though following complaints that this could only be viewed in widescreen, it was moved to the right in February 2007. Bulletins on BBC World News and BBC One also introduced similar graphics and title sequences on the same day. In 2008, the graphics were again relaunched, using the style introduced in 2007 and a new colour scheme. The Lambert Report into the channel's performance in 2002 called upon News 24 to develop a better brand of its own, to allow viewers to differentiate between itself and similar channels such as Sky News. As a direct result of this, a brand new style across all presentation for the channel launched on 8 December 2003 at 09:00. Philip Hayton and Anna Jones were the first two presenters on the set, the relaunch of which had been put back a week due to previous power disruptions at Television Centre where the channel was based. The new designs also featured a dynamic set of titles for the channel; the globe would begin spinning from where the main story was taking place, while the headline scrolled around in a ribbon; this was occasionally replaced by the BBC News logo. The titles concluded with a red globe surrounded by a red stylised clamshell and BBC News ribbons forming above the BBC News logo. Bulletins on BBC One moved into a new set in January 2003 although retained the previous ivory Lambie-Nairn titles until February 2004. News 24 updated the title colours slightly to match those of BBC One bulletins in time for the 50th anniversary of BBC television news on 5 July 2004. The countdown since 2005 has shown the elements of journalism and production involved in bringing news stories to air (2013 version shown). An important part of the channel's presentation since launch has been the top of the hour countdown sequence, since there is no presentation system with continuity announcers so the countdown provides a link to the beginning of the next hour. A similar musical device is used on BBC Radio 5 Live, and mirrors the pips on BBC Radio 4. Previous styles have included a series of fictional flags set to music between 1997 and 1999 before the major relaunch, incorporating the new contemporary music composed by David Lowe, and graphics developed by Lambie-Nairn. Various images, originally ivory numbers fully animated against a deep red background, were designed to fit the pace of the channel, and the music soon gained notoriety, and was often satirised and parodied in popular culture, perhaps most famously by comic Bill Bailey who likened the theme music to an "apocalyptic rave". Images of life around the UK were added in replacement later with the same music, together with footage of the newsroom and exterior of Television Centre. The 2003 relaunch saw a small change to this style with less of a metropolitan feel to the footage. A new sequence was introduced on 28 March 2005, designed and created by Red Bee Media and directed by Mark Chaudoir. The full version ran for 60 seconds, though only around 30 seconds were usually shown on air. The music was revised completely but the biggest change came in the footage used – reflecting the methods and nature of newsgathering, while a strong emphasis was placed on the BBC logo itself. Satellite dishes are shown transmitting and receiving red "data streams". In production of the countdown sequence, Clive Norman filmed images around the United Kingdom, Richard Jopson in the United States, while BBC News cameramen filmed images from Iraq, Beijing (Great Wall of China), Bund of Shanghai, Africa, as well as areas affected by the 2004 Asian Tsunami and others. The sequence has since seen several remixes to the music and a change in visuals to focus more on the well-known journalists, with less footage of camera crews and production teams. Changes have also seen the channel logo included during the sequences and at the end, as well as the fonts used for the time. The conclusion of the countdown was altered in 2008 to feature the new presentation style, rather than a data stream moving in towards the camera. Also in 2008, the graphic for the countdown changed, resembling BBC One Rhythm and Movement Idents, due to the logo being in a red square in inferior-left corner. To coincide with the move of BBC News to Broadcasting House, on 18 March 2013 the countdown was updated again along with several other presentation elements. Three of the most striking features of the new countdown include music performed by the BBC Concert Orchestra, a redesign of the "data streams" and the ending of the sequence no longer fading to the BBC News globe and logo, but instead stopping with a time-lapse shot outside the corporation's headquarters. The countdown was also extended back to 90 seconds, of which approximately 86 were seen before the first hour from Broadcasting House. A full three-minute version of the countdown music was made available on BBC News Online and David Lowe's own website after a remix on 16 May 2006. An international version of the countdown was launched on BBC World News on 5 September 2005 featuring more international content and similar music. Various changes have been made to the music and visuals since then, with presentation following the style of BBC News. The visuals in the sequence were updated on 10 May 2010. In June 2011, further imagery was added relating to recent events, including the conflict in Libya and views of outside 10 Downing Street. In January 2013, as part of the relocation of BBC News to Broadcasting House in Central London, BBC World News received a new countdown in the same style as the BBC News Channel's updated countdown, with some minor differences. ^ "BBC News' television output moves to new studios at Broadcasting House". BBC. 18 March 2013. Retrieved 18 March 2013. ^ "Editorial processes – How BBC News works". ^ "Delivering Quality First" (PDF). BBC. Retrieved 19 March 2013. ^ "BBC News – The Editors – Fine tuning". 22 January 2007.